Researchers and students at the University of Nairobi, the Center for Sustainable Urban Development at Columbia University, and the Civic Data Design Lab at MIT produced the map below – and the underlying data behind it – after carrying cell phones and GPS devices along every route in the network. Result? There is order to Nairobi’s seemingly chaotic matatu industry. 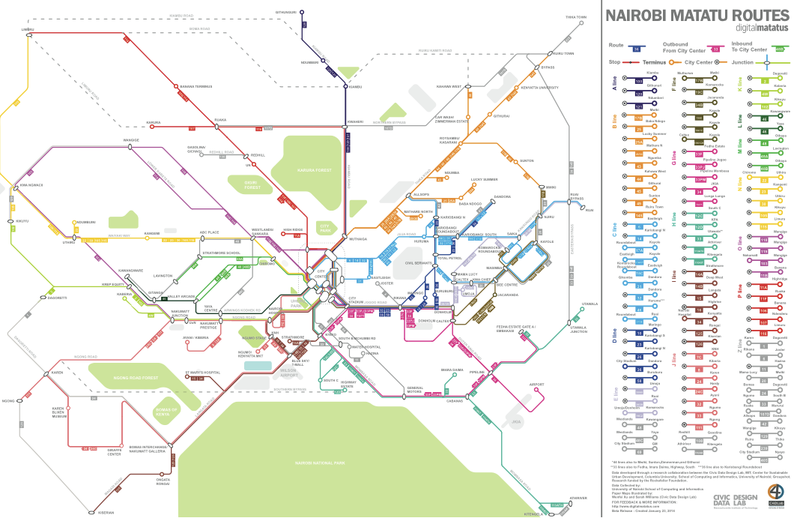 Cool, Nairobi is pretty Chaotic in terms of its transport network! Is this the chart that hangs on iHub’s wall in Nairobi? Yes it is..
Great work Professor Peter Waiganjo (UoN) and team.